More fur for fall 2014! The biggest trend on runways around the world was well represented at the Joe Fresh fashion show at World Mastercard Fashion Week. 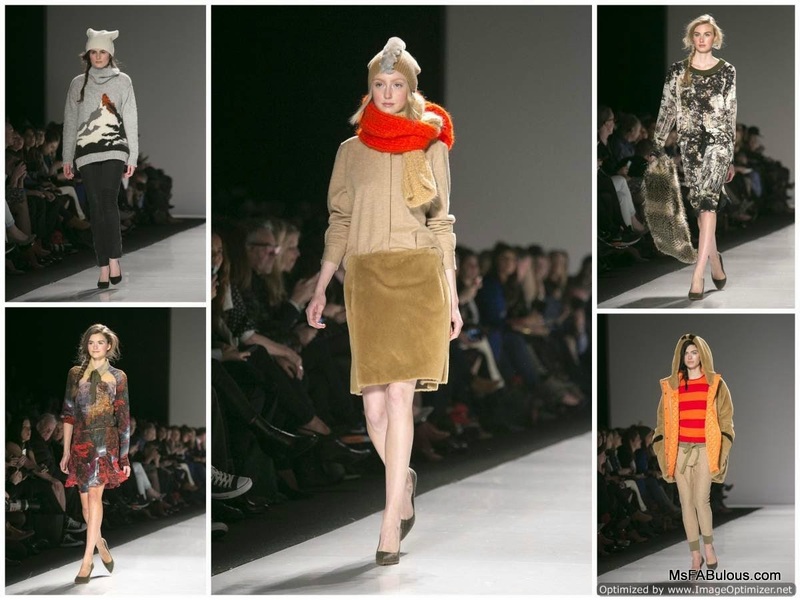 The cozy looks showed a very good understanding of the winter weather of the Canadian North. The palette was earthy, with brown, khaki, green, grey and pops of bright orange. Fur trimmed hoods, fur vests and heather knits looked warm during the still chilly delayed spring outside in Downtown Toronto. Funny, the Maybelline beauty team took the cold weather inspiration literally by giving the models a flushed cheek, pale face and pouty lip to look like they just came in from the arctic outdoors. My favorite pieces were the graphic ones. Sweaters with snow capped Canadian Rockies, a closeup of a wolf's face were artistic. There were silk dresses printed with beautiful forest artwork evoking the autumn colors I loved growing up, or the pretty contrast of dark branches against snow. The look of these pieces from the runway had a much more elegant effect than the highly accessible price point that Joe Fresh is known for. Joe Mimran and wife (Pink Tartan's Kimberley Newport-Mimran) are the first couple of Canadian fashion. They know how to capture the shoppers of all budgets and taste. I have to say I am impressed that these two keep showing their collections in hometown Toronto rather than migrating south like many Canadian brands that have found success across the border. Go Canucks!